As a Group of companies servicing over 200 core clients, the Board of Influential felt it prudent to consider the impact of the forthcoming “Brexit” vote, scheduled for 23rd June 2016. Whilst our clients are largely UK based, virtually all have operations in the EU and most globally. These clients span almost every industry sector, both public and private. From our own client discussions, their statements released to the wider Press and the more generic analyses presented by key institutions, it is clear that some of our clients could be adversely impacted by the vote, particularly those in the financial services sector, and therefore the City of London and its connected businesses. In the first 5 months of 2016, we have seen an increase in business from existing clients and in the flow of signing up new clients. Therefore, overall, we have sufficient confidence to perceive that the impact of a possible “Brexit” as being relatively small to our Group of companies. There are therefore no plans to alter staffing levels, office locations or make any other defensive changes, were Britain’s exit from the European Union to take place as a result of this vote. 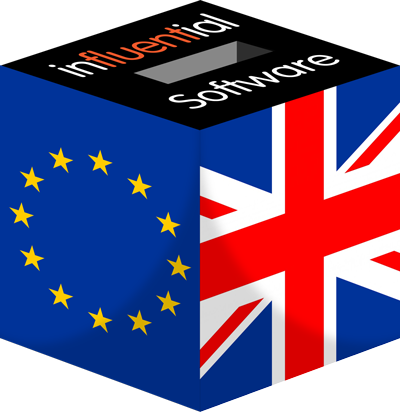 The Influential Group of companies actively delivers BI/dashboard licences, support, maintenance, consultancy, perm/contract recruitment and software development services to over 200 clients in UK/Europe.For further information on Influential’s range of services please contact Influential. Telephone 01622 757517 | email: sales@influentialsoftware.com.